Ken Branson subtlety coordinates a media event in the Rutgers Coastal Ocean Observation Lab. It was great to get this question, because often as educators we trudge along doing what we do, not really thinking about why we have been or not been successful in the various events, programs, and products we generate as part of our job. I have always been grateful for my close collaboration with our COSEE NOW evaluator, Chris Parsons, who has always encouraged me to think about effective practices, have metrics for success and evaluating the program/product with the target audience. In thinking about this I decided to go to our expert here at Rutgers University, Ken Branson from Media Relations, to help me answer this question for Marilyn. The idea of observing the ocean whole in something like real time is new, and when I first came here in 2004 I tried to sell all-encompassing stories about it entirely on its newness. This was a non-starter; it’s just too much, too many ideas and concepts, too much history to go through for people with immediate deadlines or nanosecond attention spans to handle. 1) Choose the things about ocean-observing that are intrinsically interesting. 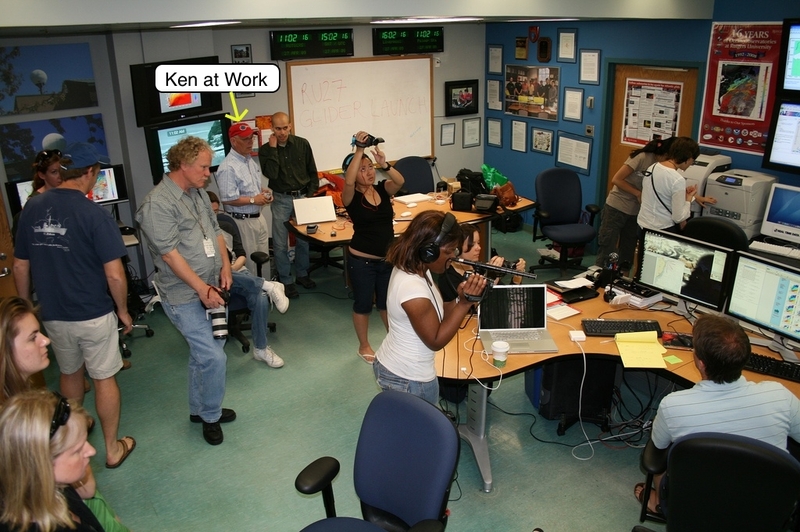 For example, during the Lagrangian Transport & Transformation Experiment (LaTTE) the fact that one of the research vessels dropped a non-toxic red dye in the water to track the Hudson Plume was visually interesting and drew in reporters. The dye itself did the trick in the 2004 and 2005 LATTE cruises; in 2006, we got reporters to spend a day on one of the research vessels, and that got us really good coverage, and coverage that was a bit deeper than in past years. In addition, reporters love the robot glider. It’s bright yellow, and watching it deployed or retrieved involves some striking visual images. The COOL room, where the glider is controlled, also provides such images. We’ve used the glider and the COOL room many times over the years to get reporters interested in ocean-observing. Eventually, we got the kind of all-encompassing stories I always wanted in the Star-Ledger and the Philadelphia Inquirer – but it took five years to get anything comparable in the New York Times, and that was on the education page, and involved the training of marine scientists. 2) Pick your media targets and find somebody working for those targets who is interested in what you do. Then look for stories among your clients that might be made to fit their interests. Encourage those people to contact your clients directly. However, in this changing information technology landscape, the media is shrinking, and the reporters you meet these days are younger, less well-educated, and have fewer resources behind them than was the case even five years ago. So your web presence has to be updated and flexible, and contain real information that ordinary people can digest and use. At Rutgers, we’re using Research Highlights web pages to tell our stories directly. We’re still learning how to do this. 3) Look for opportunities outside your usual orbit. In a networked world, a news story that appears web today in America will be on science web sites in India and China tomorrow, and in South Africa the day after that. Find a way to tell your story in a foreign language (perhaps Russian and Japanese in your Alaskan friend’s case) to get considerable bounce out of your story. We’ve done that in Spanish, mostly because that’s my second language and I knew that Spanish-language news organizations had bureaus in New York. Oddly, we got coverage in local Spanish-language media, not because I’d pitched, but because they subscribe to Agencia EFE, the big wire service, which reported on our work. 5) Immediate relevancy is a big help. We’ve gotten coverage of Dr. Michael Kennish’s work on eutrophication and Barnegat Bay because what happens at the Jersey Shore immediately impacts the consciousness of millions of New Jerseyans. Mike, by the way, shares some important attributes with Scott, Oscar, Josh and company – passion for the work, and a willingness to talk about it to anybody, anywhere, from academic symposia to the Knights of Columbus meeting in Little Egg Harbor Township to the lady standing in line with him at Shop Rite. 6) Work closely with your science content experts. Regarding Scott, Oscar, Josh and their colleagues in COOL – well, you couldn’t wish for better clients. They’re available, patient and clear. They’re almost never all away at the same time, and when they are, they let me know. They’re patient with me and my limited scientific knowledge; they’re patient with reporters, too. No question is ever too dumb for them. They’re clear in their answers and speak with a bare minimum of scientific jargon. And they’re passionate about their work, which they think belongs, not to them, but to everyone. That means they want to talk about it to anyone who’ll listen, and they’re open to advice from me about how to do that. They respect my experience and skill, and the experience and skill of reporters I send to them. This includes their students, by the way, and not just their grad students. All these attributes make them relatively easy, even fun, for reporters to deal with, and that means that reporters come back to them over and over for information about marine science. I should also tell you about tactics that are almost sure to fail, about things that are almost never news, and about things that get in the way of real news and kill your story. 7) Avoid trying to do too much with news conferences featuring ribbon cuttings, political or agency speeches etc. Reporters know the score. If you have nothing for them but suits and PowerPoint presentations, they will stay away in droves. We once held a news conference to announce that the EPA, thanks to one of our congressmen, had agreed to pay for planting shell as oyster substrate in Delaware Bay. On a blistering June morning, that congressman, the local assemblyman and state senators, the mayor, the commander of the local U.S. Army Corps of Engineers unit, some upper-level EPA and DEP managers, and assorted other officials stood behind a podium and said what a fine thing it was. (Well, it was, but everyone knew that.) Then we took the reporters out on the boats and let them watch and film the shell being planted in the bay. What do you think the stories were about? I think the local congressman got mentioned (as he would have whether he made the speech or not), but all the other suits might just as well have stood in bed and saved us all from being devoured by greenhead flies while they talked. It was the boat ride the reporters came for, and the shell planting they wrote and broadcast about and photographed. 8) Be cautious of academic symposia. These are important, but they’re not newsy. Unless the symposium has real news – that we’ve found a way to turn the gas from mid-ocean vents into ozone-layer-friendly fuel, or that we’ve found Noah’s Ark on a mid-ocean ridge – forget about it. 9) Limit Jargon. Teach your clients to use simple sentences instead of compound ones, compound sentences instead of complex ones, Anglo-Saxon root words instead of Latin root words, and the active voice instead of the passive one. Save the passive voice, the scientific name, and the run-on sentence for peer-reviewed journals. 10) Watch your Acronyms. Spell them out on first reference, then use them as little as possible after that. Use them only for organizations. It’s ocean-observing systems, not OOS. But Integrated Ocean Observing System is a proper noun, so spell it out on first reference and then use the acronym. Small thing, you might think, but a page, or an academic’s mouth, full of this alphabet soup just gets in the way of the good stuff. 11) Limit discussion of government and academic hierarchies. Answer questions about them but don’t lead with them. If they ask why all these different universities are working together, that’s a good time to talk about IOOS or MARCOOS. But if you lead with alphabet soup, you’re dead. 12) A “word from our sponsor”…grants. The grants are sometimes worth a mention, especially if they have big dollars attached. And they may be worth a story if they fund some area of research never before funded or reflect an approach to a problem never before taken by the government. But mostly, reporters tell us we should talk to them after we’ve done whatever the grant funds us to do. LATTE was a five-year, all-stops-pulled-out study of the Hudson Plume, and had huge scientific implications. But when the grant was originally awarded, reporters ignored it – understandably, in my opinion. It was all those research vessels visible from the beach, that big red stain in the ocean, and those trips out to the research vessels in 2006 that did the trick. So, what is your advice to Marilyn? Add your 2 cents and tell us what makes a successful media event. That’s really a neat concept. A simple way to develop an outreach product for distribution to student and public audiences. Now we just need to work on creating a few that tell OOS stories and link the data they collect with the real-world problems we’re trying to solve. Something to think about. Thanks for sharing Chris!